People who use inhalants on a frequent basis open themselves up to any number of adverse effects. Much like other commonly abused drugs, the longer a person uses the more damage the drug causes. Inhalants produce fast-acting effects that wear off fairly quickly compared to other drugs. These characteristics make for a high abuse potential. 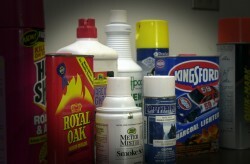 Inhalants commonly used include everyday household products, such as video head cleaner, gasoline and butane. Inhalants act on brain and central nervous system functions by slowing down the body’s chemical processes. Over time, the effects of inhalants become more and more apparent as different areas of the body start to break down. After a certain point, users experience some of the more distressing effects of inhalants. The physical effects of inhalants develop within seconds of using the drug. According to the University of Maryland, inhalant effects most resemble alcohol intoxication in terms of depressing or slowing down brain and central nervous system processes. For the most part, the effects of inhalants starve the brain of oxygen, forcing the heart to work harder to get blood flowing to the brain. Since an inhalant “high” tends to wear off fast, users are inclined to use the drug repeatedly in order to sustain the drug’s desired effects. Abuse of inhalants can cause asphyxiation. The fumes produced by inhalants displace available oxygen supplies in the lungs. In effect, inhalants prevent air from entering the lungs, which can lead to suffocation. Displaced oxygen supplies also reduce the level of oxygen made available in the bloodstream. This condition sets up a chain reaction that impairs brain and central nervous system functions. Reduced oxygen supplies to the brain cause damage to the cerebellum and cerebral cortex, which in turn can bring on causes hallucinations, slurred speech patterns and memory impairment. Inhalant effects on the central nervous system cause damage to nerve cell structures leaving users with persistent tingling sensations, numbness and even paralysis in the worst of cases. The brain relies on a certain level of electrical activity to maintain normal functioning. Inhalant effects interfere with the brain’s chemistry, triggering the release of GABA and glutamate neurotransmitter chemicals, both of which help to regulate electrical activity in the brain. With a high enough dosage amount, inhalants can actually shut down electrical activity in the brain. When this happens, users can go into a comatose state. The “high” effects of inhalants typically only last for a couple minutes, driving users to ingest the drug repeatedly in rapid succession. The brain cells affected by inhalant effects undergo considerable strain, which makes them less sensitive to the drug. In turn, users must keep ingesting increasingly larger amounts in order to experience the desired effects of the drug. This cycle will continue for as long as a person keeps using inhalants. The effects of inhalants on the heart’s electrical activity place users at high risk of developing irregular heart rhythms when using the drug. According to the National Institute on Drug Abuse, these conditions can cause heart failure, also known as “sudden sniffing death,” where heart functions shut down altogether. The behavioral effects of inhalants stem from how these drugs warp the brain’s reward system. The brain’s reward system shapes the mind’s belief systems and dictates the types of thought patterns and emotional responses a person experiences throughout any given day. These processes shape a person’s behaviors and overall outlook on life. With repeated drug use, the chemical imbalances brought on by inhalant effects offset dopamine levels in the brain, the chemical most responsible for regulating reward system functions. With ongoing inhalant use, a psychological dependency takes hold at which point addiction has set in. Addiction breeds its own mindset, driving users to create an entire lifestyle that centers around getting and using the drug. Declines in functional capacity become apparent within a person’s work and/or school performance as inhalants take on top priority in his or her life. In effect, a person’s motivations have shifted considerably, placing important areas in his or her life in jeopardy. As inhalant effects continue to compromise the brain’s cognitive functions, users start to display unusual risk-taking behaviors that can place them in trouble with the law. Impulse control problems and poor decision-making abilities account for these changes. According to Medscape, suicidal ideations develop out of the overall psychological dysfunction that takes root once a person becomes addicted to inhalants. Extreme mood swings and severe bouts of depression make users more susceptible to engaging in self-harming behaviors. The brain’s tolerance for inhalants increases at an extremely fast rate. After a certain point, the effects of inhalants can no longer produce a “high.” Consequently, users will likely seek out stronger types of drugs to perpetuate the addiction cycle.